The Model Educational Loan Scheme has not stipulated a service area approach to finance under the scheme. While proximity to the residence of parents was considered an advantage in KYC compliance, the scheme allows the student to have a choice in deciding on the bank from where to borrow. The Committee, however, noted that SLBC in Kerala and some of the DLCCs in Tamil Nadu had allocated villages / wards in urban centres to different banks for the purpose of entertaining applications under Educational Loan Scheme. This, we understand, was an attempt to evenly distribute loan applications among participating banks. The Managing Committee felt that such arrangements should not preclude a student from approaching any bank of his choice for sanction of loan. The Member Banks are therefore, requested to instruct their branches not to reject loan applications merely for the reason that the particular area is allocated to another bank by SLBC / DLCCs. The Model Educational Loan Scheme envisages that in the normal course, an education loan should be sanctioned / rejected within a period of 15 days of receipt of duly completed application with supporting documents. Rejection, if any, has to be with the approval of controlling authority of the branch concerned and the reason for rejecting should be communicated to the students in writing. The Managing Committee decided to reiterate the position and appeal to the banks to ensure that the branches follow the laid down norms in sanctioning / rejection of loan applications. The guidelines issued by Reserve Bank of India and Govt. of India require banks to have robust grievance redressal mechanism within the institution. The arrangements need to be widely publicized with details of contact persons / escalation matrix etc. The Managing Committee decided to draw the attention of banks to the need to have these facilities made available / known to students approaching the banks for sanction of loan. The Committee also suggested that the banks may provide a toll free line for receipt of complaints and the number may be prominently displayed in the branch premises. It was also decided that banks should take penal action against branch managers who repeatedly refused / rejected applications for education loan. The controlling authorities should be advised to counsel such officials initially. Officers who do not show improvements in this regard may be warned in writing and thereafter banks could initiate such disciplinary measures as deemed fit. The Managing Committee considered the recommendations made by the IBA Committee on Educational Loan Scheme and after detailed discussions decided to incorporate a provision for financing meritorious students who pursue courses under management quota seat in an institution for reasons of convenience (proximity) or choice of course. We enclose a copy of the revised Model Educational Loan Scheme. Your attention is drawn to changes made in paragraph 4.1 and notes to paragraph 4.3 in this regard. The changes made are indicated in bold italics. The Managing Committee observed that the Model Educational Loan Scheme provided for financing students who pursue degree / diploma in nursing in recognized institutions. Many of the banks had also reported that they were sanctioning loans for pursuing nursing courses. Managing Committee after detailed discussions decided to include degree / diploma in nursing in the indicative list of eligible courses and these are made in Para 4.2 (a). We have duly incorporated necessary changes in the existing scheme after approval by the IBA Managing Committee. 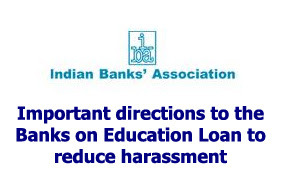 We enclose copy of Model Educational Loan Scheme for pursuing higher education in India and Abroad (September, 2012) for Member Banks’ information and necessary action.